“How do most people drink their Coke?” Maxilimian Riedel asked as he popped open a can and placed it in front of me, alongside a plastic cup. “From the can,” I said. We were at the small Riedel booth at Vinexpo, the biennial wine trade fair in Bordeaux. I was surrounded by other vendors offering first growth this or grand cru that, vintage Armagnac, almost any exclusive alcoholic beverage in the world, and this man was offering me a Coke. He poured some into the plastic cup and directed me to touch the can, then the cup. “Notice the can is cold, but the cup is warm,” he said. (He didn’t give me the chance to point out that the can had been refrigerated.) “The plastic cup actually warms the drink.” He produced a glass – not just any glass, but a Riedel Coca-Cola glass, designed specifically for the famous soda and with a shape reminiscent of the iconic Coke bottle. He poured some into the glass, and a thick foamy mousse formed on top of the soda. “Notice the bubbles,” he said. “Yet the drink in the plastic cup has gone flat. The cup kills the effervescence.” The glass was also cold to the touch, reflecting the temperature of the drink. I smelled the cup. There was that prune flavor again. But when I stuck my nose in the glass, I was hit with the sting of carbonation, a Proustian moment that took me back to childhood, a time when we drank soda out of a glass rather than a can or a honking-huge cup with a straw poked through the lid. 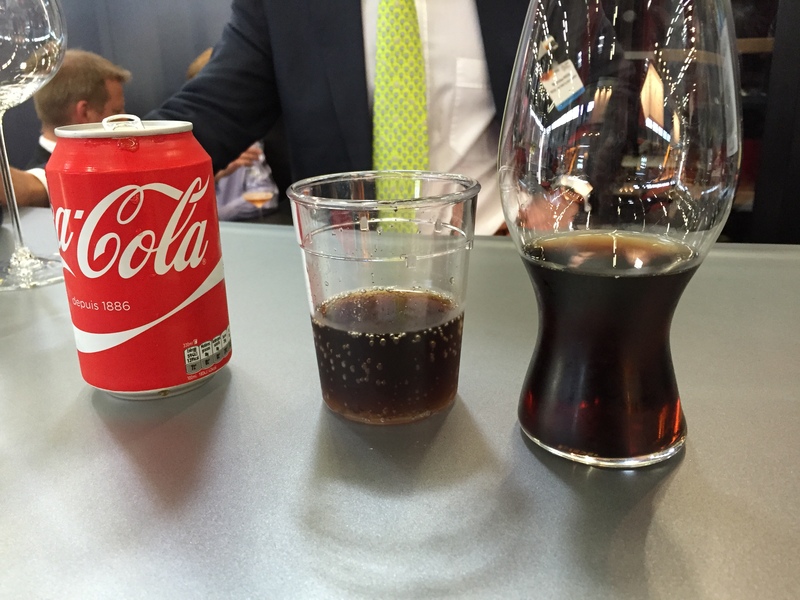 When the Riedel Wine Glass Co. unveiled its Coca-Cola glass in early 2014, I just shook my head. Was there nothing they wouldn’t try to sell us a special glass for, I wondered. (Yes, Riedel makes water glasses.) The skeptic in me has always balked at the idea that we need a special line of glassware for each grape variety, for instance. I recognize glassware does make a difference in the way wine tastes, but have always felt an expensive stem is most appropriate with the finer wines where nuance is crucial, and expensive. Riedel is the aristocrat of wine glasses; why would we need a Riedel for something a proletarian as Coke? I took a sip from the fizzy glass and hiccupped loudly. “Only two people in the world supposedly know the formula for Coca-Cola,” Riedel said. “But here you can taste lemon, lime, cinnamon and maybe some clove.” So much more interesting than sugary prunes. Max Riedel may not have figured out the secret formula, but he reminds us of what we’ve lost in our modern craving for convenience over flavor. This entry was posted in and tagged Coca-Cola, Other Drinks. Bookmark the permalink. But did you taste the lemon, lime, cinnamon and (maybe) clove with the magic Riedel glass? Yes – that was the Riedel that drew out those flavors. I should add that the Coke glasses are not as expensive as Riedel wine glasses – about $12 on Amazon. It would be interesting to compare them to the old Libby Coke glasses. There are other factors at work here. Coke in small thick glass bottles (with the original bottling plant stamp on bottom) vs in 2 l plastic jugs was better preserved. But most important was the move away from cane sugar to high fructose corn syrup :((. In NYC you can get Mexican Coke with cane sugar… the oil lobbyists are wimps compared to those protecting sugar prices! Mexican coke in a glass is the only one worth drinking. I RARELY drink soda but there is a marked difference. And I bet a Coke tasted good after all that wine. Good article. And as a Coke aficionado, I can confirm that Coke purchased in a can tastes far superior to Coke in a glass bottle.